The CCIE Security Advanced Technologies Course uses a hands-on demonstration approach designed to provide you with a CCIE-level understanding of the technologies covered by the current blueprint of Cisco Systems' CCIE Security Lab Exam. Taught by Brian McGahan CCIEx3 #8593, it contains more than 39 hours of highly advanced instruction on cutting edge CCIE-level technologies. 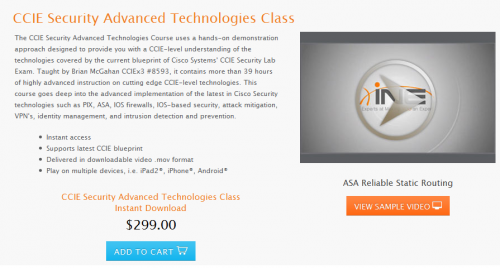 This course goes deep into the advanced implementation of the latest in Cisco Security technologies such as PIX, ASA, IOS firewalls, IOS-based security, attack mitigation, VPN's, identity management, and intrusion detection and prevention.